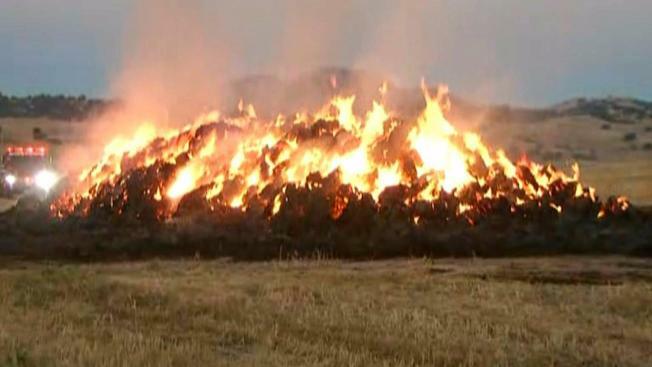 A large pile of hay bales in eastern Contra Costa County was torched by flames late Tuesday and early Wednesday, according to a fire official. Bob Redell reports. A large pile of hay bales in eastern Contra Costa County was torched by flames late Tuesday and early Wednesday, according to a fire official. The blaze ignited around 10:30 p.m. Tuesday just off Empire Mines Road near the Brentwood-Antioch border. Cal Fire crews resorted to letting the hay, which was just farmed three weeks ago and valued at roughly $25,000, burn overnight because there wasn't a water supply in the nearby area, a fire official said. Two Cal Fire crews stayed on scene overnight to monitor the blaze. It is unclear how the blaze started, but fire officials are treating the blaze as suspicious. Another vegetation fire also cropped up in Fremont near the Dumbarton Bridge overnight. Roughly one acre was burned. The cause of the blaze is not yet known at this time. Despite the abundance of rainfall California accumulated this past winter, fire danger is still extremely high across the Golden State. "The problem we're having though is all that grass has grown and mixed in with the tree mortality we've had over the last five or six years of the drought, we've got well over a 100 million dead trees in California and the thing that's saved us in the past few years is we didn't have the grass to lead into that timber," Mike Marucci from Cal Fire said. "Now we do so we're really nervous." Cal Fire is at full staffing in anticipation of a busy wildfire season.